Despite that most Halloween apps are about the ghosts and ghoulies, sometimes, the most effective fear comes from real life. That’s right; there are bugs that exist that you might not see. Creeping and crawling all over the place. They could be in your bed, in your hair! What’s more scary then that!? That is why we all need an instant, quick reference to the most common bugs that bite us when we least expect. Brought to us by Logical Images, Bedbugs ‘n Things is available on the iPhone, iPod touch, and iPad for $0.99. Bedbugs ‘n Things is a very fast, surprisingly informative guide to a whole catalog of little critters that usually have their warning signs appear on your skin. Red bumps, scabs, and other gross things can sometimes be identified as the bug feeding on you so having a collection of the most disgusting references can be incredibly useful. Image references, where they live, bite examples, treatments, and some different little factoids about the little buggers. The bugs this app covers are listed in the Bug ID button. Bedbugs, Fleas, Mosquitoes, Scabies Mites, Ticks, Head Lice, and… disturbingly enough, Pubic Lice. Each bug has a page of descriptions ranging from their life cycles, habitat preferences, behaviors, etc. It’s all extremely informative and you might learn some surprising tidbits about them. Next, you have a Bite Checker to see if you might have bed bugs or is it just some minor skin irritation. 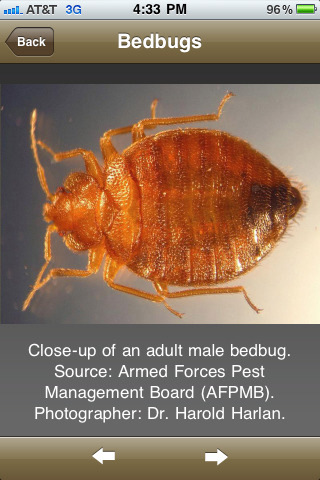 Treatments details some basic to-dos if you do happen to find matching bites, Travel Checklist is a list of steps you can take to prevent giving the bugs a free ride to your house, and finally the Bug Reports button to submit a case of bedbugs to www.bedbugregistry.com. I can’t say that this system couldn’t be abused, but if you are paranoid about this kind of thing, it’s a good reference. You get pictures, descriptions, preventatives, treatments, and it’s all packaged in a quick search. No need to search ‘rashes and bites’ in Google to see thousands of utterly disgusting images that are completely unrelated to your ailment. Get a quick list of common bite marks and you’re set. No need for internet access or a computer, especially while camping or visiting other countries. I found Bedbugs ‘n Things extremely informative and helpful for travelers and for paranoid people. Yes, this will be a horrible app for people who are afraid of bugs, but if you can stomach seeing the images of them or reading about them, this is a great reference for you. If you travel, camp, or are just a person with a distinct hatred for bugs, check this out and get all itchy and squeamish like me. AppSafari review of Bedbugs ‘n Things was written by Joseph Ho on November 8th, 2010 and categorized under App Store, Featured, Health, Reference, Utilities. Page viewed 6327 times, 1 so far today. Need help on using these apps? Please read the Help Page. Bedbugs ‘n Things is a very fast, surprisingly informative guide to a whole catalog of little critters that usually have their warning signs appear on your skin.